Mmmm! I’m glad to hear about your lo-fi kitchen – I sometimes feel like a freak because we don’t have a toaster, but, honestly, we just throw any bread/bagels under the broiler and away we go. I didn’t think that I was a kitchen gadget person… but I now know that I am! :) I’m sure I’d get along just fine without all of the stuff…. I could be a gadget / tool person too! :) I think living in a tiny white cottage forces me to keep it slim. The spiralizer is great fun and we’ve used it for carrots, cucumber and even potatoes for hash browns. Knowing how beautiful your cooking is, you’d love to experiment with one. I am not a gadget person either but these have been on my mind. I think you have me convinced to get one too! Thank you for stopping in and leaving me a comment today. :) Nice to see you here. I have been looking for spiralizer inspiration. I think I may adapt to make it dairy free.mthanks for sharing. How healthy and refreshing for scorching noons! 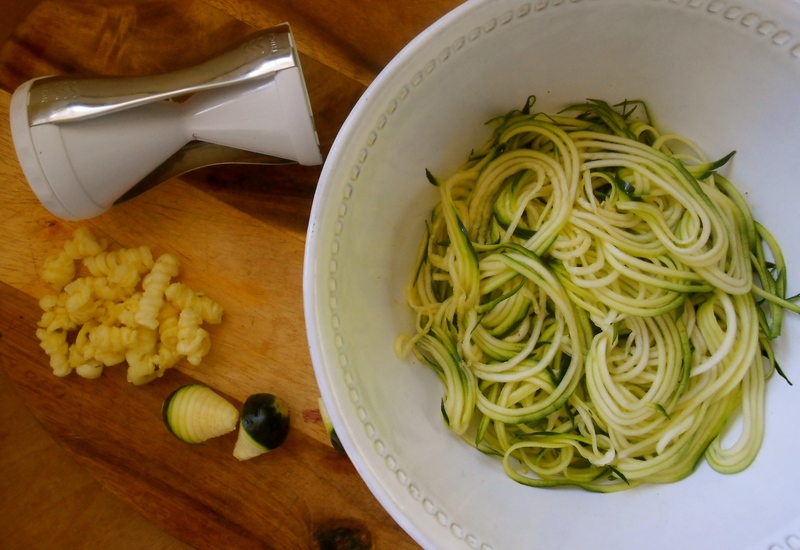 Hi Seana – looks like you have zucchini noodles mastered – they’ve been on my list for a while and they really do look so good, I could almost pretend to myself I was eating pasta! Not particularly gadget minded, but I could be tempted. Another solution to the courgette (zucchini) glut! I have the exact same spiraliser in a rather fetching mint green colour in my kitchen drawer. Dang. I want a mint colored one! :) Do you use it often? It’s a hot item in my kitchen right now. All the time. One sure fire way to up the vegetable intake of teenagers. I love spiralising cucumber and then lightly pickling with vinegar, sugar and salt. Now that we’ve moved into Autumn I’m substituting the cucumber for broccoli stalks. Sounds strange but it works. I adore my spiralizer. We have a vegetarian-focused day on my Farm to Table curriculum and I have the students make “pasta”. They are fun. My husband recently bought me one of these contraptions. I need to use it! This looks yummy! This looks beautiful and delicious! Pesto sounds like a great sauce for them! I am definitely going to try this. Did you just eat it cold? See Nicole, that’s what happens with kitchen gadgets! They get lost. :) Well, hope you rediscover yours and make a delicious bowl of zucchini. Elegant indeed. Very healthy too. Spiralizer has done a wonderful job for you! As you have introduced this, I will be looking for it. 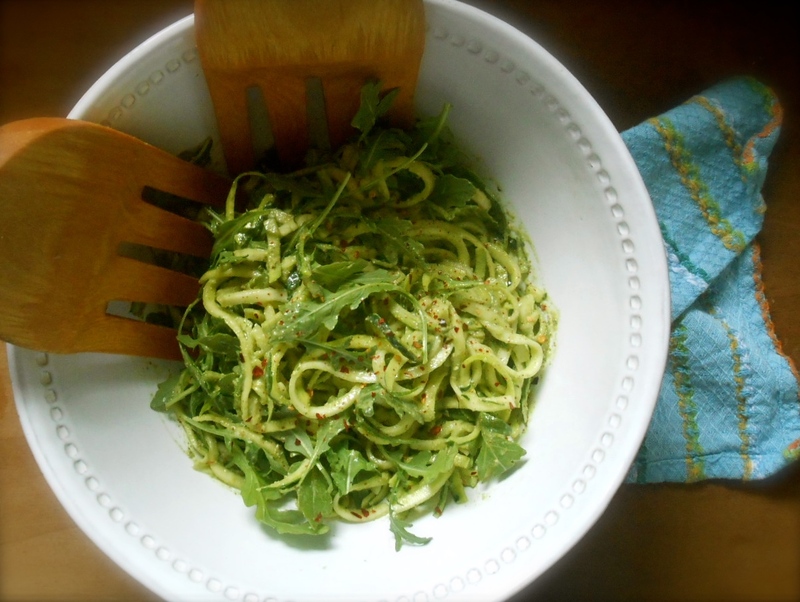 I like the simplicity of this recipe and the fresh pesto! Thank you for this recipe! You have done a great job without kitchen “gadgets” with your cooking and recipes! I might have to “restrain” myself from buying the sprialzer from our local BBB! Such a lovely and clever alternative to pasta/noodles Seana! Must have been fabulous mixed with the pesto and arugula (that which we call ‘rocket’ over here)! I try to keep my kitchen gadgets to a minimum… but not really succeeding! ;) I miss being able to shop at BB&B, Crate & Barrel and Williams Sonoma! This sounds so good–I’m going to have to get a spiralizer! :) Thanks Nancy. You’ll enjoy it! Looks fantastic! I recently discovered zoodles and can’t stop eating them. 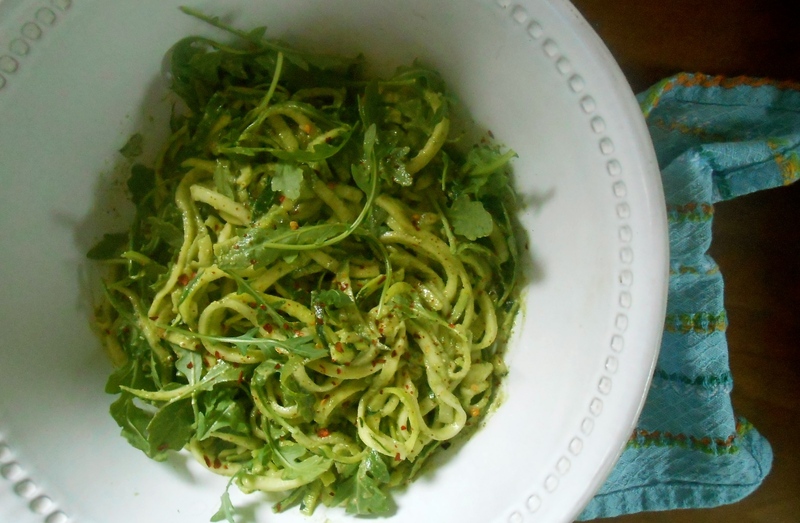 Plus, its so fun to use that spiralizer! Your kitchen and my kitchen sound the same….we both own spiralizers but neither microwaves, food processors or mixers! I know…we have our priorities straight, right! :) We can’t quit eating them either. The dressings and sauces are endless. I even tried to force potatoes through it. It worked but not easily. I guess it’s best to stick with circular produce! Good for you for being simplistic in the kitchen (in terms of gadgets only!!) This recipe look delicious :) I love pesto on just about everything.. will have to try it with the zucchini noodles! That’s weird.. Thanks for letting me know though.. I just updated some of my plugins so I think the error might be resolved. It seems to be working from my end at least. Please let me know if you’re having any further issues! Would love to keep in touch :) Thanks! You are currently reading zucchini noodles at COTTAGE GROVE HOUSE.